The Kona Chocolate Run had a costume contest for this race so I had to think of something. Costume categories were: chocolate, superhero, or holiday. I couldn't think of a superhero that I wanted to be. Cat woman, Wonder Woman, and Bat girl costume ideas didn't really make my skirt fly up. The chocolate theme had potential and I looked at quite a few tutorials on how to make a Hershey Kiss costume. But the holiday option - now we're talking. So many options! I knew I wanted to go with Thanksgiving instead of Christmas because hey, it's still before Thanksgiving, gosh darn it. 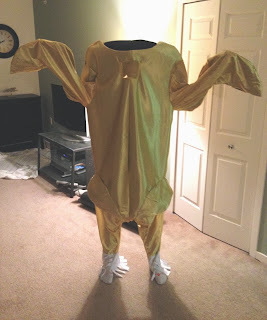 I've gotten a kick out of my turkey hat in years past, so I was thinking about what to do with a turkey hat...be a turkey dinner! Of course! The options for decorations are endless. I put together an Instructable on how this was made. It's pretty easy! One of my favorite things about this costume was how easy it was to customize. Looking for usable items for the table in thrift stores was half the fun. Delicious fake food! Mmmm gravy. To support the table, I ended up pinning a bag stuffed with a blanket to my chest. It helped and allowed me to rest my arms at times, but I realized that I would not be able to run normally as a turkey dinner, so I adjusted by pace. My arms were sore the next day from holding the table, it ended up being quite the workout! There was a cold rain at the start, which did a number on the glue on my glass and corn, and my taper candle didn't survive the race with my weeble wobble running. Still, I'm impressed that everything else stayed on! Near the very end of the race, a woman in front of me said "I can't be beaten by the turkey dinner!" So I sped up a bit and when she turned around I was right there. She really took off after that! I wasn't going to pass her, just trying to help her in her final kick. Motivated by a turkey dinner. My time ended up being 39:03, 12:35 mile/pace. The race was huge - 6,000 runners and walkers! - and the finish line was pretty crowded as the 10Kers and the faster 5Kers had already finished. People were really nice and let me, the big ole table, navigate my way through the chocolate line crowd. This was the inaugural Kona Chocolate Run and it had a few minor bumps, one of them being that the chocolate line was incredibly long. I heard later that it was a 45 minute wait. My brother, his girlfriend, and I skipped on the chocolate because of the wait time, but the Kona folks have already started working on improvements for next year, including better chocolate line traffic flow. My costume was one of the winners! There was a super cute gingerbread girl I saw in the costume judging line in front of me. I hope she won too, she was absolutely adorable. Not my fastest time, but it was certainly one of the funniest! 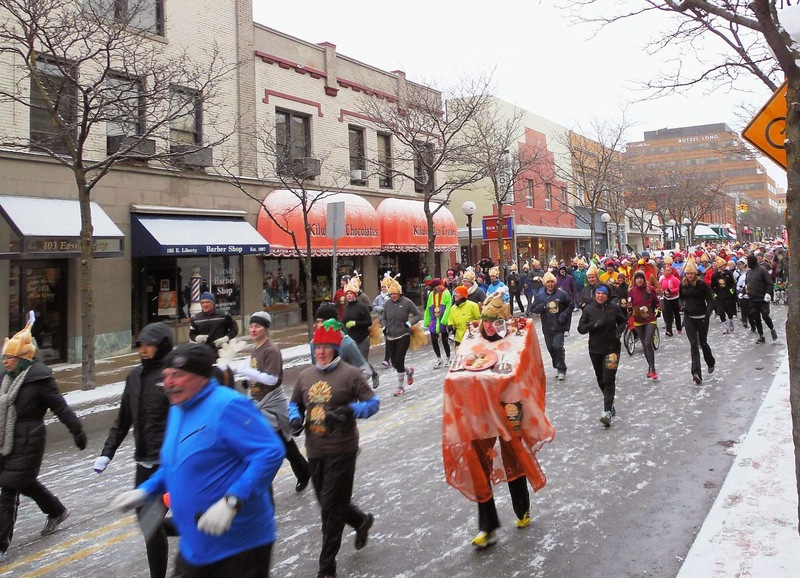 There are two Ann Arbor Turkey Trots in Ann Arbor. This one is hosted at Hudson Mills Metropark and is a lovely, slightly hilly course. It's mostly paved trail but there is a bit of gravelly road. My 10K PR came on this course, but today I was sticking with the 5K. The weather was sunny and awfully windy. This costume was the hardest thing I've ever had to run in. There is a small mesh panel so you can see, but the costume does not sit easily, so the mesh panel is always migrating downwards until all you can see is the ground. It took 40 minutes to finagle with getting the costume on, and I still wasn't happy with it by the time I needed to head to the starting line. 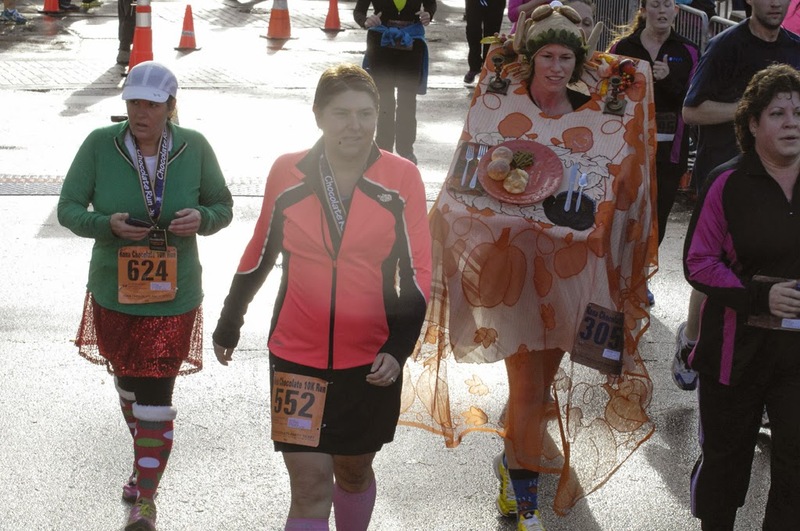 I put on the tutu, safety pinned that to my running tights, and then pinned up the turkey drumsticks so I could run more easily. I tried pinning the costume in all sorts of ways to help see better, but it wasn't happening, so I was stuck with holding it up. The sunny day was beautiful, but it was reflecting off the mesh that was letting me see out of the costume, so I could barely see at times, eep! Because the mesh panel that let me see out kept wanting to slide down, I had to run with one hand at all times holding the top of the costume up. This is not easy! I kept having to switch arms because my tiny t-rex arms were getting so fatigued. My arms were still sore later in the day from keeping the costume up. But it had to be done! One of the highlights of the run was coming up along a man pushing his kiddo in the stroller. The little man in the stroller was telling his dad that he was done with running (we were maybe a mile in.) When I passed them, the dad said "Look, a turkey1 Do you want to run with the turkey?" There was a long pause and then an "okay." Kid approved! That made the whole costume worth it. There were a lot of "go turkey! "s at the finish line which really helped me - I was bushed! 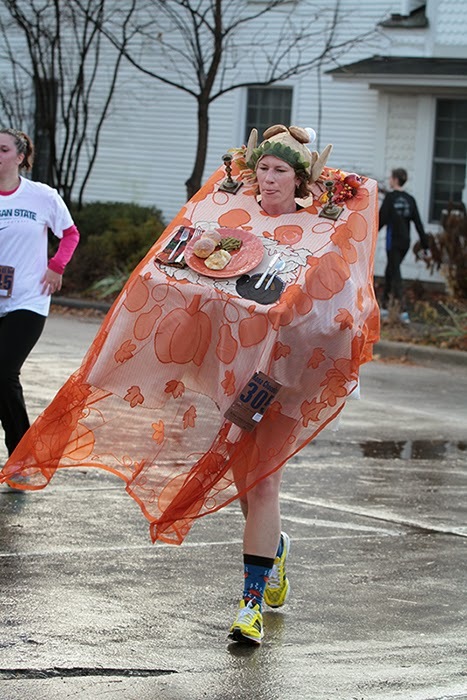 Some people really got a kick out of the costume, but I would not suggest this one for racing. Way too difficult to see out of. This one's from back in August, but is the Red Carpet Run is my favorite race of the year. Everyone is dressed to the nines! They're $9 shoes from Target with black fabric flowers and white feathers glued on. They held up great! 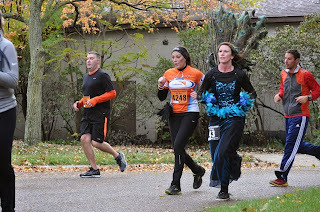 I was at a local thrift shop looking for inspiration for what to wear for this year's Halloween races when I discovered a beautiful teal dress. The fabric had a great shine to it, and the bodice had sequins; perfect for a peacock costume! I picked it up for $8 and then was on a quest to find other pieces to complete the costume. 36"-40" feathers from featherstore.com. I ordered 50, but 30 would've been fine. I discovered it's much cheaper to order online than buy in stores. Flat sequin shoes from Payless. I am a minimalist runner, so as long as the shoe had zero drop or close to it, I was good to go. I cut out a piece of foam core that was the same shape of the feather tail and then wrapped the foam core in duct tape. This piece would be the support for the peacock feathers. The foam core isn't waterproof, so the duct tape made sure the structure would stand if the weather wasn't favorable. The duct-taped foam core was glued with tacky glue to the tail and left to sit for a day. When first adding the feathers, I sorted through them and took the longest ones, and added those to the tail with the peacock eye facing away from the back. I originally tried to tacky glue the feathers down, but the shaft of the feathers were not sticking very well. I discovered that duct taping them was much easier! I taped down a row of long feathers, and then did another row of shorter feathers. A few more rows were added, trimming the feathers as needed. For the shoes, I added gold glitter around the edge, but this ended up coming off in the wet grass. I took four peacock eyes from my feather pile and glued a feather on top of the shoe, and one on the side. The feathers stayed on just peachy. For the feather boa, I pinned it onto the dress with safety pins. This way I could easily remove the boa and wash the dress later. For makeup, I went heavy on eye shadow called "peacock." 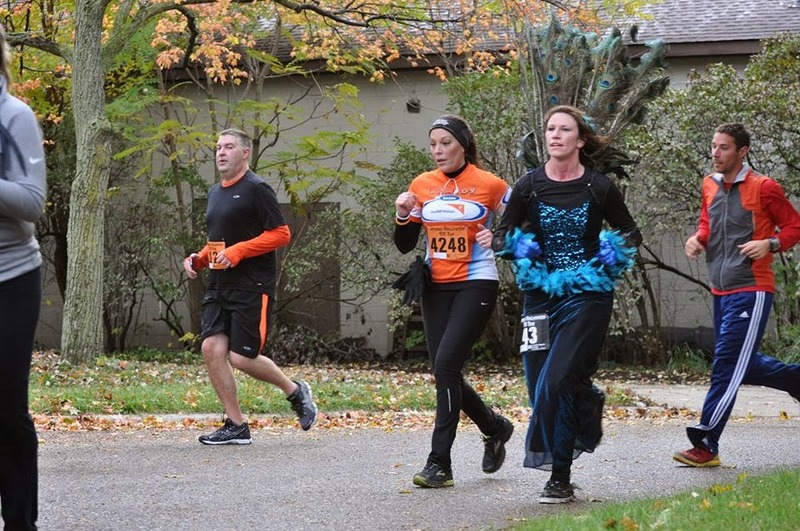 It was pretty chilly out when I was wearing the costume, so I wore black long-sleeved shirts and black running tights under the costume. The outfit was a hit! Nothing like a costume with some height. And peacock feathers are so pretty! At the start of the Wicked Halloween 5K! There wasn't that much drag. It felt like a light tug on the back of your shirt. So not too bad at all. Feathers flying toward the finish! This costume ended up winning the 2013 Wicked Halloween 5K/10K costume contest! I was awfully excited about that, there was some stiff competition!